This product consists of two durable stainless steel disk electrodes with 8 mm (0.31") diameters and 30 mm (1.18") spacing. 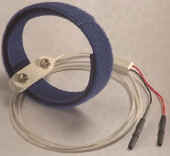 The electrode holder features a feed-through for the fixation of the Velcro strap. 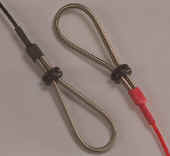 The electrode is coded for polarity. One adjustable Velcro strap is included. De cable has a length of 1 meter (40"). The cable terminates in a connector of choice. Our bipolar felt pad electrode is available with an adjustable Velcro strap. The product consists of two versatile and convenient stimulating electrodes. The surface stimulating electrode consists of two 8 mm (0.31") felt pads in a stainless steel holder. The spacing between the tips is 25 mm (1.0"). Each electrode is coded for polarity. The felt pad tips should be soaked in a normal saline solution for a few minutes, before a small amount of gel is applied. 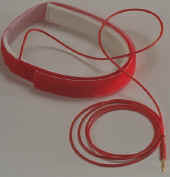 Four felt pads are included in the electrode package. 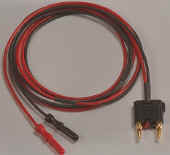 The 1.00 meter (40") cable terminates in a choice of connectors. The Velcro straps are designed so that you can flexibly adapt their size. This provides comfort to the patient while holding electrodes securely. Straps may be attached to each other for large limb applications. The size is 0.02 meter (0.79") x 0.55 meter (22"). There are 3 straps per package. 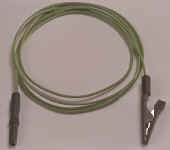 One clip, with 1.00 meter (39") green silicon cable, terminating in a DIN 42 802 connector.